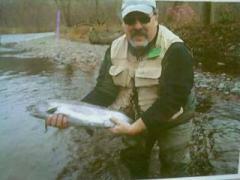 CTFishTalk.com: didymo in Farmington - Connecticut Conservation & DEP ( CT Conservation & DEP ) - A Community Built for Connecticut Fisherman. Hey all I figured this was probably the best place to put this. Just an FYI for all the guys who fish the Farmington river especailly above Collinsville. the DEP released a statement this morning conriming that the invasive algae Didymo has been confrimed to have infected the Farmington river. Right now it is present from the Riverton Bridge down intot he TMA. so remember to help stop it's rapid spread use the Inspect, Clean and Dry principle after fishing there. Not sure what this will mean for the overall health of the river only time will tell.